The big news in the anime world is that Hideyuki Kikuchi’s âVampire Hunter Dâ may be hitting the silver screen soon. Woo!Â According to a report in the horror magazine Rue Morgue, Kikuchi is working on a live action âVampire Hunter Dâ film in addition to a new anime feature. The story also says that Hideyuki Kikuchi and a producer from the âBiohazardâ (aka ‘Resident Evil‘) video game series will be working with one another on the live-action film. Originally published in 1983 as series of novels by Kikuchi and illustrator Yoshitaka Amano, âVampire Hunter Dâ focuses on lone warrior named “D” in a post-apocalyptic world that combines elements of pulp genres: western, science fiction, horror, high fantasy, folklore and occult science. The planet is overrun by vampires and other supernatural beings, as well as mutants, technological creations and so on. As a dhampir (half-vampire/half-human), D is one of the best vampire hunters out there. 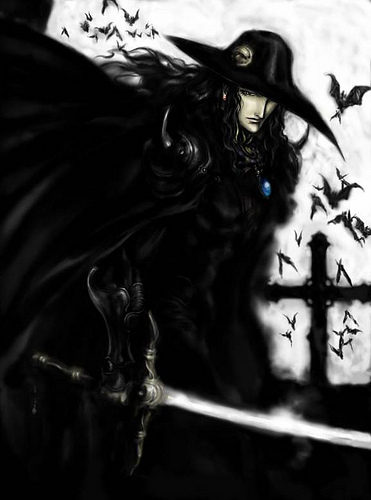 âVampire Hunter Dâ is probably best known in the U.S. for the popular anime adaptation which was released in 1985. Another animated film â âVampire Hunter D: Bloodlustâ â came out in 2000. Additionally, the very long-running novel series has also been adapted into several manga volumes. And with so many volumes in the series you may want to catch up and pick up the Readerâs Guide once itâs released.